Many people think of Freeport, Maine, as a shopping mecca. The anchor store was opened in 1912 by Leon Leonwood Bean, creator of the famous Maine Hunting Shoe. Today L.L. Bean dominates this small New England town, although in recent years many other stores have taken over the town’s main street and made this a shopper’s heaven. The 9-mile loop takes you out to Wolfe’s Neck Woods State Park where you can see the rocky coast. There is seaside camping off Lower Flying Point and Burnett Roads. 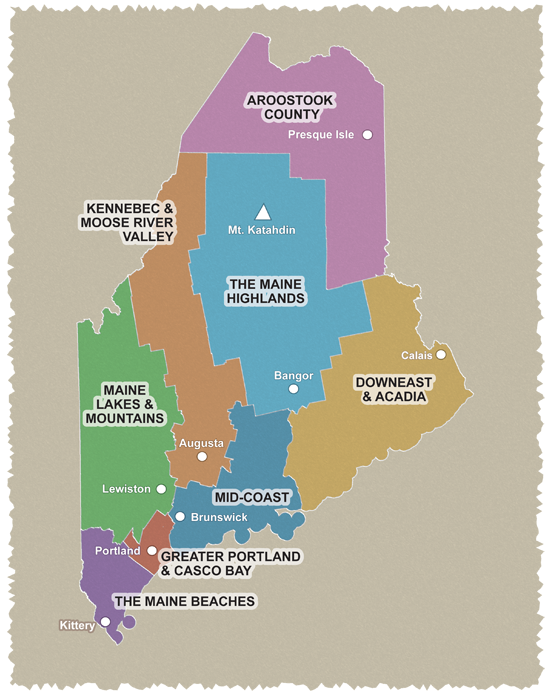 The 16-mile loop explores the back roads in the Freeport area and goes by the Maine Audubon Mast Landing Sanctuary. The 18- and 33-mile loops take cyclists through the lesser-known scenic pleasures of Freeport and nearby Brunswick, home of pretty Bowdoin College and the Joshua L. Chamberlain Museum. To see Wolfe’s Neck Woods State Park, a gem of a small park, see the 9-mile loop directions. Cautions: Moderate traffic and narrow roads. Some roads have no shoulders. Starting point: All rides originate from Leon Gorman Park on Bow St (0.6 mi from Main St/US 1) in Freeport. From the South, take Exit 20 off I-295 and follow signs to the business district. Turn right at the traffic light on Bow St for 0.6 mi to park on left.